We examine the potential role of “solar radiation management” or “sunlight reduction methods” (SRM) in limiting future climate change, focusing on the interplay between SRM deployment and mitigation in the context of uncertainty in climate response. We use a straightforward scenario analysis to show that the policy and physical context determine the potential need, amount, and timing of SRM. SRM techniques, along with a substantial emission reduction policy, would be needed to meet stated policy goals, such as limiting climate change to 2 °C above pre-industrial levels, if the climate sensitivity is high. The SRM levels examined by current modeling studies are much higher than the levels required under an assumption of a consistent long-term policy. We introduce a degree-year metric, which quantifies the magnitude of SRM that would be needed to keep global temperatures under a given threshold. The online version of this article (doi: 10.1007/s10584-012-0577-3) contains supplementary material, which is available to authorized users. 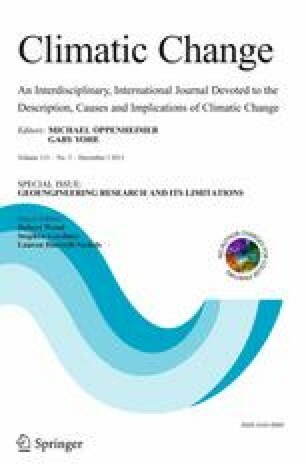 This article is part of a special issue on "Geoengineering Research and its Limitations" edited by Robert Wood, Stephen Gardiner, and Lauren Hartzell-Nichols. The authors would like to thank James Dooley, Jae Edmonds, Steven Ghan, Page Kyle, Veerabhadran Ramanathan, and two anonymous referees for helpful comments. This research has been funded by the Fund for Innovative Climate and Energy Research (FICER) at the University of Calgary with additional support from the Pacific Northwest National Laboratory.